EVE Suite is the software tools suite for EVE Home and Building Automation systems. It includes the licensed server software, the core of the whole solution, the professional configuration software to plan your projects together with user interfaces and the App for smartphones, tablets and Pc to control your Smart Home from anywhere. EVE Suite can be downloaded and used completely free of charge for your tests and demos (in this case the server software is provided full-featured, but not licensed). The EVE server enables communication between different systems and devices in the home including the heating, lighting, blinds, windows and doors, locks, cameras, music, appliances and switches. The system performs tasks according to schedules and taking into account such things as the season, weather and occupancy. 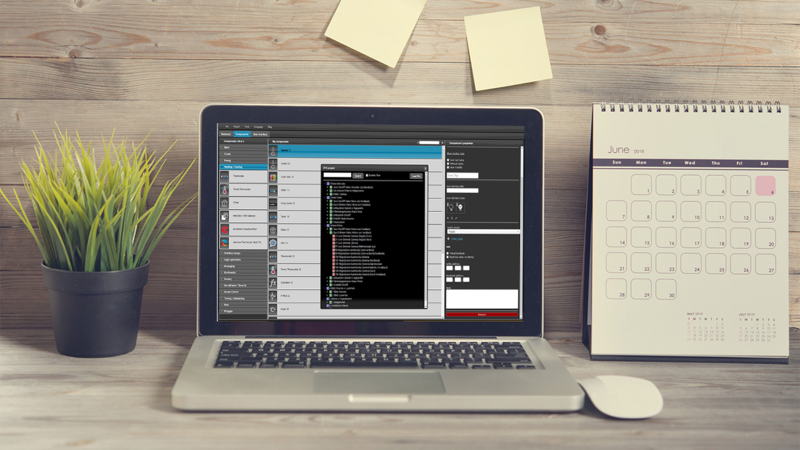 EVE Manager is the software that allows you to program your EVE server and plan your project. Your Smart Home configuration is created and loaded onto your EVE server. EVE Manager provides all the components you need to make tasks work, it’s really easy to use and allows an high customization of user interfaces. 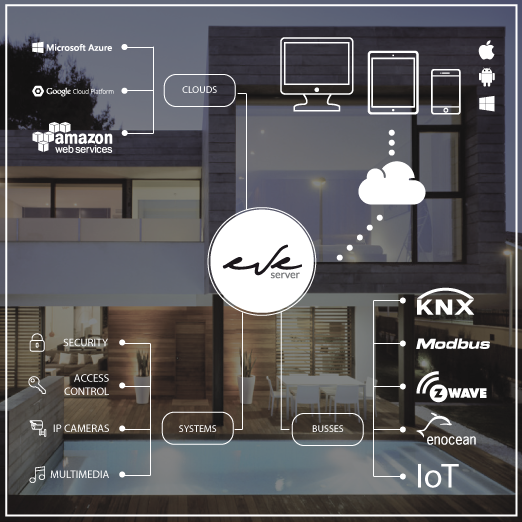 Whether iOS or Android, smartphone or tablet, Windows PC or MacOS – you can control your EVE Smart Home with EVE App. EVE Remote allows you to connect from anywhere using WiFi, 3G, Edge connections, without the typical idle time requested by other systems based on the web. The response is immediate, even using a low-speed connection. EVE Server is a powerful software which turns your installation into an energy-efficient and future-proof home, compatible with the most well-known technologies for building automation. EVE Server is flexible: no matter how your home changes over time, the system can be expanded whenever the need arises. EVE Manager is the programming tool designed for configuring EVE Server unit. Plan and design countless graphical interfaces for countless users. Graphical interfaces can be arranged with a high level of customization and can be used by all clients and all devices. Take control of your Smart Home via our free app for Android, iPhone, iPad and desktops Mac OSX and Windows. You can monitor and manage your Smart Home from anywhere in the world via EVE Remote Plus app. Simple, intuitive and fast. TRY EVE SUITE. FOR 7 DAYS. FOR FREE!